13.31mm x 14.05mm / 0.524in. x 0.553in. High Polished Front and Back Flat Young Boy's Head Charm by Rembrandt Charms. The width is 1/2 of an inch. 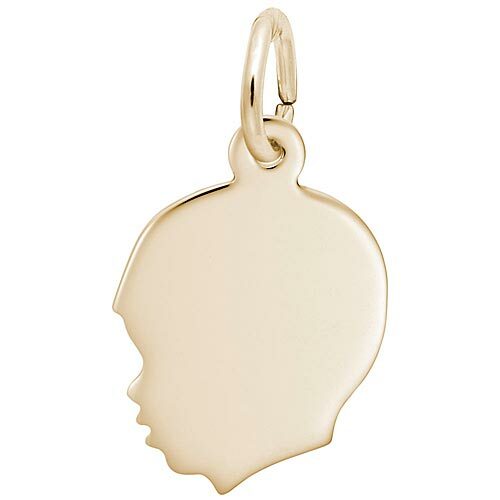 Our flat young boy's head charm is a great gift for mom. Customize the front and back by engraving the boy’s name and birthday. This boy silhouette charm can be placed on a necklace or will be a wonderful addition to a Charm Bracelet. All Rembrandt Charms are available in either silver or gold. The matching girl’s silhouette charm is style 2498.